Tips from Deanna Minich, leading nutrition professional? The art of nutrition (and the science) is a practice that has captivated me. Starting as early as my adolescent years, it has carried me from a passionate interest and professional focus through, more recently, a healing journey with autoimmune conditions. Someone who has masterfully crafted this “art” is a nutrition professional introduced to me a few years ago while I was studying public health and the University of Illinois, Chicago. As you can imagine, the opportunity to see her speak live was something not to be missed! Deanna Minich is an educator, scientist, author, and sought after speaker. She seeks to focus on health and vitality through healing protocols that are both scientific and creative. Throughout her career, she has sought to “unite people to talk about food in a cohesive way.” In doing so, she relies on colors of the rainbow as a primary teaching aid. Her newest book, The Rainbow Diet: A Holistic Approach to Radiant Health Through Foods and Supplements , encourages a nourishing relationship with food and includes recipes, activities, and a wealth of information. As she explained in her live talk, food is both information (the scientific lens) and connection (part of the art). One illustration is from a look at “healing spices”. Flavor brought about from specific spice and herb combinations can be definitive to styles of cuisine. As it turns out, there are also certain healing properties of these plant compounds (otherwise, informative). However, they can also warm the heart, so to speak, and bring about larger concepts, such as social connection. Across the various profiles from turmeric and paprika to parsley or cilantro, we see the colors of the rainbow begin to emerge. Shifting into a larger edibles, we can look at whole foods, such as strawberries, carrots, potatoes, cabbage, and kale (to name just a few). Not only are these foods power houses for various phytonutrients related to skin and flesh colors (information), they can elicit specific moods and feelings (connection). Digging deeper into color, there is an emotional spectrum associated to various colors of the rainbow, such as red commonly associated to energy. That being said, as an educator, connecting food options can become just as much creative as it is scientific or routine. Embrace small bites & sampling – Avoid falling into the phytonutrient gap. Across all color groups, eat a wide variety of foods in smaller doses of each to optimize micro-level nutrition. 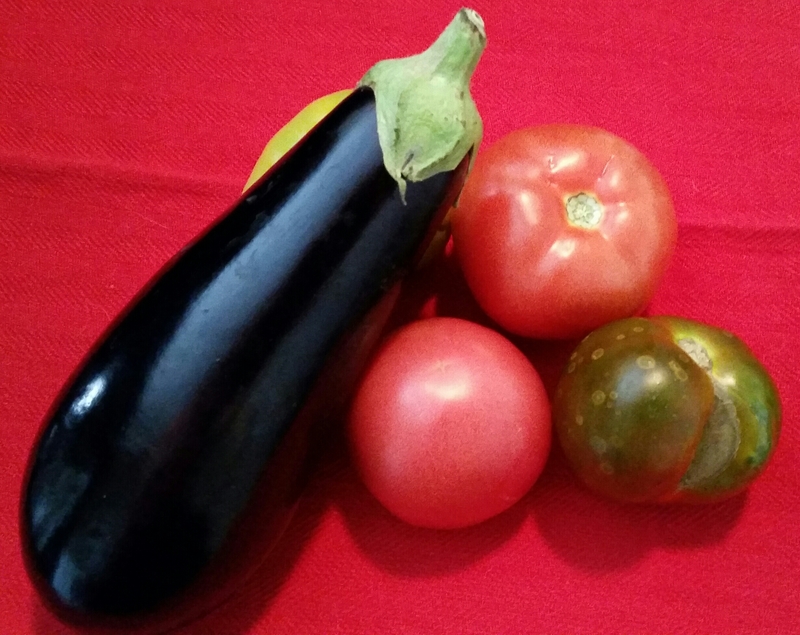 Consider the possibilities – Don’t like tomatoes and worry you may be missing lycopene? Guess what, nature figured that out. There are other foods in nature that will deliver the same compounds. Try watermelon, guava, or cooked sweet red peppers. Aim for ripeness – Foods picked when they are ripe, generally deliver more optimal nutrient profiles. Therefore, buying direct from the source and eating seasonally becomes quite relevant. For scenarios in which this can not occur, there are a few sensory tips and tricks to follow OR we even have newer technologies to guide us. Couple up – Some micro-level nutrients absorb better in the presence of macro-level compounds such as healthful fat or complete protein (ie “food synergy”). Get creative – Buy yourself a box of crayons and mark yourself up a colorful canvas each week representing different foods you intake by color. Are any of the colors missing from your canvas? ***Thank you to the Chicago Functional Forum chapter including Dr. Amy Weiler and Anne Gnuechtel for organizing and hosting this impressive presentation. Affiliate links may result in a small amount of monetary income. I was so excited to review this recipe from Minimalist Baker (with credit to my CSA for including in their weekly newsletter, #TomatoMountain). Such a great Spring recipe. Kudos for adding a little healthy fat in the cashews. If you have noticed a recurring theme of “purple” in my blog, this is no coincidence. Both red and purple have presented themselves as signature colors in my life. When I was a little girl, I had to have the pastel lavender option for various toys and products, such as an 80’s style tape recorder “boom box”. In college, it just so happened I joined a sorority with national colors purple and white, therefore, continuing the theme of purple in my life. Aside from fashion and home accessories, I love to find the color in nature. Turns out food is a great place for it (see my 2015 blog post “Blue-Purple”). …and so, without further delay, another recipe share. Again, this is inspired by Sarah Britton. However, as we begin to pull ourselves out of winter and think about Spring, I love to start thinking about salads again. This one has become a go-to in my life and will, undoubtedly, become a classic as time goes forward. In addition, the spice and herb focus to the dressing not only brings about a flavorful punch, it is a savvy way to pack in a little extra nutrition. I highly recommend to try at least a small amount of cayenne pepper, even if you think you don’t like a hot spice. The cinnamon combination creates a nice balance. One adjustment I have done in the past is blend figs into the dressing itself. At certain times of the year, I can find organic green figs in the frozen section for a reasonable price. Black figs (or Turkish as I most prefer) can be a little pricey. A few weeks ago I was fortunate to attend a Rick Bayless cooking demo in Chicago, IL. Intertwining story telling while performing a demo is certainly a skill that he has developed. Beyond the recipe, I thoroughly enjoyed learning more about his perspective on food. Although his cooking style is different than mine, he shares many of the same ideas in which I embrace including, but not limited to, learning methods from other cultures and seeking understanding of the food itself before taking on any culinary endeavors. In addition, he spoke of being knowledgeable and considerate for the sensory system. One of my graduate level nutrition classes, placed great emphasis on this as well. It was in this course that I was first introduced to the concept of umami, the fifth taste, which also embodies what we have come to know as “savory”. Besides salt, sweet, sour, and bitter, foods that elicit umami are often viewed as superior in some way. Underlying this perspective is a unique interplay within our human biochemical pathways adding further scientific support as to why humans favor the umami taste. However, essentially, umami contributes to making a prepared dish palatable. (It’s also a very fun word to pronounce out loud). Additional information on umami can be retrieved from the resources at the bottom of this post. On the day of the demo, Bayless incorporated a dish including autumn squash and pork to illustrate umami. From my understanding, it is the smoked component of the pork that would elicit the umami response. Personally, I do not eat pork. Therefore, upon his suggestion, I tried a version of the recipe with mushrooms. I certainly can not take credit for the creative vision and wonderful turn out of this dish. It is all a credit to Bayless. However, I love to share innovative food concepts and, therefore, am summarizing my take on the recipe. First, I started with the salsa like sauce by blending pan-roasted onions, tomatillos, and whole garlic cloves. I added a little bit of Co-Op hot sauce to the tomatillo blend which gave it an orange-like hue. Then, I sauteed the mushrooms in coconut oil. With the squash, I had a little help from my CSA who has been sending us an assortment of frozen, pre-prepared vegetables to fill in the lower production of fresh items during the winter months. #TomatoMountain. Therefore, I simply heated this in a pan over low-heat. Finally, layered the items to be served and topped with pumpkin seeds as my non-dairy substitute/swap to cojita cheese. Even though I may have selected a slightly too hot version of Co-Op sauce, I still lived up every bite of the dish. Without question, it embodies umami! Beauchamp, G. (2009). Sensory and Receptor Responses to Umami: An Overview of Pioneering Work. The American Journal of Clinical Nutrition, 90(3), 723S-727S. Chaudhari, N. P. (2009). Taste Receptors for Umami: The Case for Multiple Receptors. The American Journal of Clinical Nutrition, 90(3), 738S-742S. Curtis, R. (2009). Umami and the Foods of Classical Antiquity. The American Journal of Clinical Nutrition, 90(3), 712S-718S. De Araujo, I. K. (2003). Representation of Umami Taste in the Human Brain. Journal of Neurophysiology, 90(1), 313-319. DuBois, G. (2004). Unraveling the Biochemistry of Sweet and Umami Tastes. Proceedings of the National Academy of Sciences of the United States of America, 101(39), pp. 13972-13973. Lindermann, B. (2000). A Taste for Umami. Nature Neuroscience, 3, 99-100. Lindermann, B. N. (2002). The Discovery of Umami. Chemical Senses, 27(9), 843-844. Mau, J. (2005). The Umami Taste of Edible and Medicinal Mushrooms. International Journal of Medicinal Mushrooms, 7(1/2), 119. Yamaguchi, S. (1998). Basic Properties of Umami and Its Effects of Food Flavor. Food Reviews International, 14(2-3), 139-176. Yamaguchi, S. N. (1998). What is Umami? Food Reviews International, 14(2-3), 123-138. Yamaguchi, S. N. (2000, April 1). Umami and Food Palatability. The Journal of Nutrition, 130(4), 921S-926S. One of my favorite food blogs is My New Roots by Sarah Britton, Holistic Nutritionist & CNP. Fairly recently, she also published a book and last week I discovered it in Whole Foods. Her work is near to perfect synergy between flavor, nutrition, and food artistry. She pays special attention to varied food availability or dietary protocols and often provides alternative suggestions. I relate well to this approach. Earlier this year, I saved the recipe below to Pinterest. As we dive into winter, I am reminded of it. So far my winter CSA has been most regularly dividing up orange and purple carrots, turnips, radishes, a hearty variety of spinach, and a few beets. #tomatomountain I can’t help but see making a version of this dish in my near future! It amazes me how, collectively across facets, people can spend so much time focused on what goes on their body in order to look vibrant, colorful and full of life, yet may only devote a fraction of that time for what goes inside it. There is a classic line I learned while working in production planning, “garbage in, garbage out”. The phrase can definitely be applied to meal planning as well. Living in a large city brings no shortage for the opportunity to watch people. All too often, I observe the pinball activity within in the average workday, aka the daily grind. It is not uncommon to see anxious people knocked back-forth, up-down, and sometimes down the shoot, figuratively of course. Between scarfing down Starbucks at breakfast, another cup of joe or two at the office, grab’n go at lunch, and then, finishing off with take out for dinner, it is hard to imagine how much, if any, thought went into it at all. As practitioners, we have latched on to health promotional advice suggestive of “eating a rainbow” and I am not talking through the consumption of iconic multi-colored candies. Across epidemiologic studies, the approach is consistently favored and most likely achieved through consumption of a diet rich in plant-based foods. For my science lovers out there, I will include the citations for two reviews of the study data in the references section; Boeing, et al completed in 2012 and Wang, et al completed in 2014. Despite this commonly accepted recommendation, it can be easy to get off balance. In fact, some colors are more commonly deficient than others. According to Dr. Deanna Minich, one of my favorite nationally recognized nutrition professionals, blue-purple is the most common deficit in human diets (2015). Although she didn’t explicitly say it, I interpret this statement to be meant for the standard American diet. Minich adds that blue-purple colored foods have certain phytonutrients critical for the brain, such as in the support of learning and memory, (2015). Last week I hit the blue-purple lottery. Summer has seemed to take added time to arrive in the upper Midwest this year. However, our luck has finally started to change. The most recent farmers markets were filled with blueberries, blackberries, eggplant, and purple cauliflower and I noticed the super market offering US grown, organic blueberries at an in-store price. Plenty of opportunity to absorb this beautiful color category! 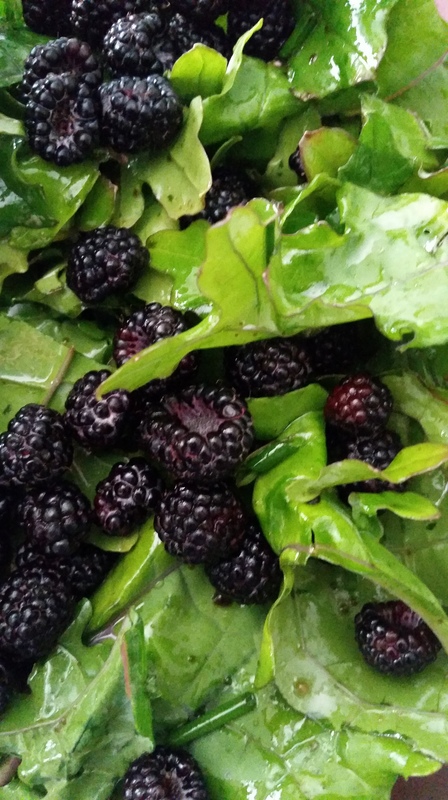 The blackberries, from Ellis Family Farm, more or less melted in the mouth. I paired half of them with kale and chives dressed in olive oil and balsamic vinegar. In particular, I spoiled myself by using chocolate olive oil that I picked up from the Olive Tap in Manitou Springs, Colorado while traveling. I receive a weekly CSA (community supported agriculture) delivery from Tomato Mountain Farm in Brooklyn, Wisconsin. 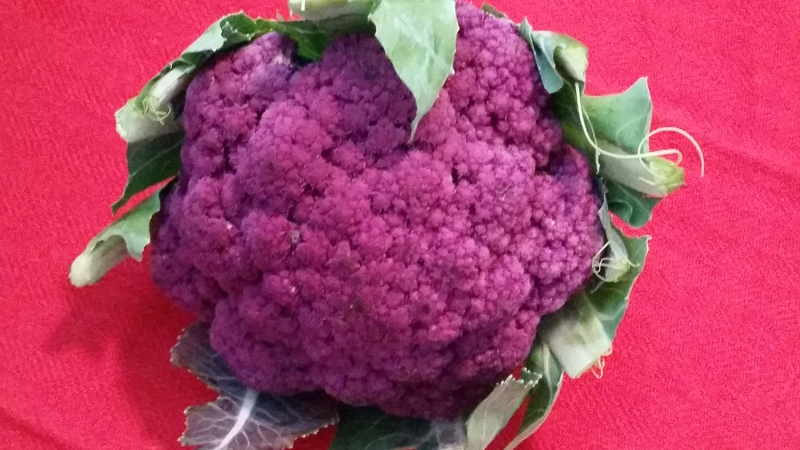 Despite receiving broccoli the past two weeks, I couldn’t resist at least a small cut of the purple cauliflower from Nichols Farm and Orchard that caught my eye as I dashed through Daley Plaza farmers’ market on my lunch break walk. I used it in a curry recipe. On Saturdays, I often walk with some people in the neighborhood and we have started passing through Green City Market in Chicago’s Lincoln Park. There, I picked up a small eggplant from Iron Creek Farm which I sliced and pan fried in coconut oil eating half, then saving the remainder to dice up for eggplant-cabbage-mushroom dumplings. With the exception of the preparation that goes into the dumplings, none of these cooking/preparation methods are challenging, nor take a lot of time, and should fit into a busy lifestyle. The salad was a quick toss. I didn’t even chop the kale, just stripped the leaves from the stems and proceeded to tear apart any pieces that would be too large. After working out a few great spice combinations, curry has become an easy go to. Simply simmer the coconut cream with the spice combo then serve over steamed vegetables. If desired, pair this with a meat option and/or layer over rice or quinoa. In this case, chopping vegetables becomes the biggest challenge and I can assure you, if that becomes your biggest challenge of the day, you have had a great day! 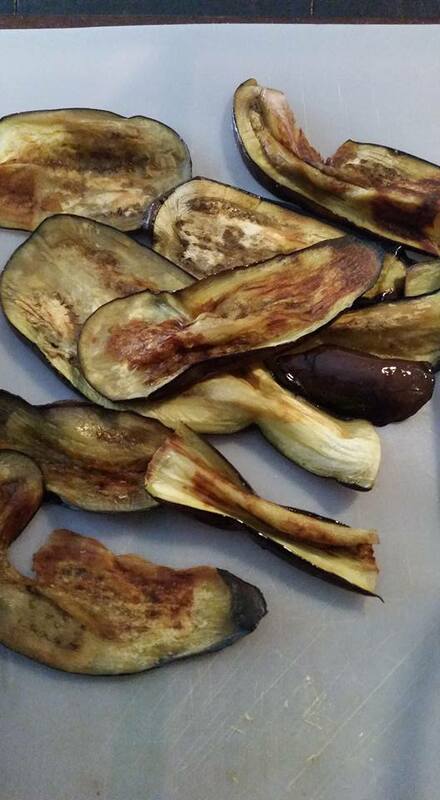 The sautéed eggplant may take a little finagling to figure out the proportion of oil most preferred (I used a pretty modest amount), but again, the hardest part is likely the time it takes to slice. I would guess it to take under 5 minutes. In order to best wrap this blog post up in a pleasant conclusion, my take away of the week is to remember how vital color is for your inside. I have used blue-purple as an example, but each color category contributes its own set of unique attributes and internal benefit. The next time you stare down your closet, accessories, make-up, perfume/cologne selection, etc. figuring out how to best highlight your assets and look attractive for the day; please do remember your inner eco-system loves color too. Make your inside radiate just as much as your fashionable outer self. For more information on Dr. Minich’s approach to food and nutrition, be sure to check out http://www.foodandspirit.com and if you are stumbling over “phytonutrient”, WebMD has a consumer friendly write up at http://www.webmd.com/diet/phytonutrients-faq (Metcalf, 2014). Boeing, H., et al (2012, Sep). Critical Review: Vegetables and Fruit in the Prevention of Chronic Diseases. European Journal of Nutrition, 51, 637-663. Retrieved from http://www.ncbi.nlm.nih.gov/pmc/articles/PMC3419346/. Metcalf, E. (2014, Oct 29). Diet & Weight Management: Phytonutrients. Retrieved from http://www.webmd.com/diet/phytonutrients-faq. Minich, D. (2015, Jan 19-26). Whole-Self Nourishment for Pain and Inflammation: A Seven Step Approach to Breakthrough Vitality [Digital slides and audio]. Retrieved from painreliefproject.com. Wang, X., et al (2014, Jul 29). Fruit and Vegetable Consumption and Mortality from All Causes, Cardiovascular Disease, and Cancer: Systematic Review and Dose Response Meta-Analysis of Prospective Cohort Studies. BMJ. Retrieved from http://www.bmj.com/content/349/bmj.g4490.